Lawrence Lazio was one of several attendees to comment during the meeting. 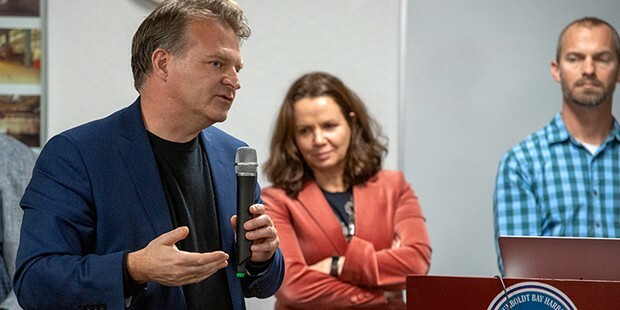 It is, Nordic Commercial Director Marianne Naess said during the meeting, an opportunity to place "Humboldt and Eureka on the map" as an aquaculture innovator. While the plan has garnered enthusiastic support from some corners, an air of skepticism also abounds, as evidenced by several speakers who emphasized few specifics have been released — one noting the "devil is in the details" — while others questioned the seeming rush to cement the agreement. 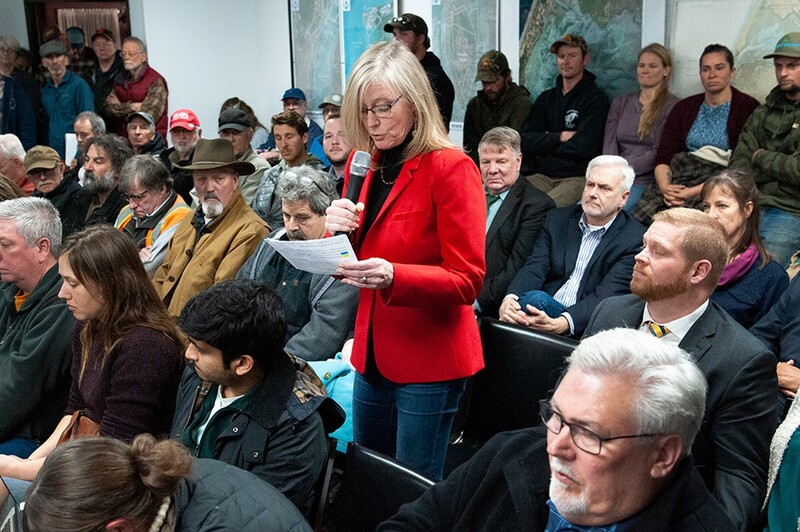 Among the standing-room-only crowd, many identified themselves as members of the local fishing community, noting they wished the harbor district was putting less energy into a fish farm and more effort into maintaining the harbor for those who are still trying to make a living off the sea — the very people who worry they may end up in competition with the proposed endeavor. Several commissioners said the lease agenda item was just about the land and this was only the start of a long process that will have ample opportunity for public comment. "This is step one," Commissioner Larry Doss said. "This is the beginning of due diligence." 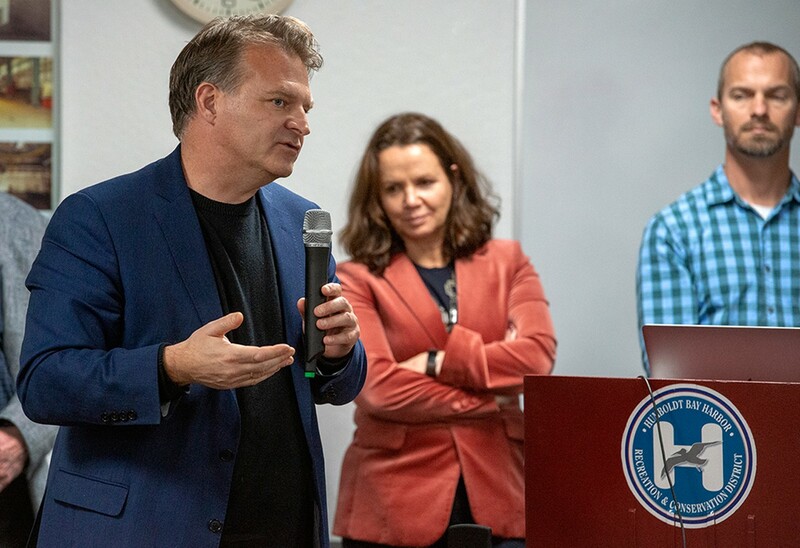 According to Nordic, the company is looking at raising salmon, yellow tail kingfish (which it does in Denmark) or steelhead using a recirculating aquaculture system, or RAS, which utilizes large tanks and water treatment systems. The method, the company says, prevents many of the common issues associated with raising fish in offshore pens, including pollution from waste, chemical use and the potential to pass on diseases and parasites to wild fish. According to the harbor district, the project will include "the removal of all remaining deteriorating buildings and unutilized infrastructure" at the 30-acre property, which was the site of a multi-agency clean-up effort in 2014 to avert a looming catastrophic environmental disaster on the edge of Humboldt Bay. 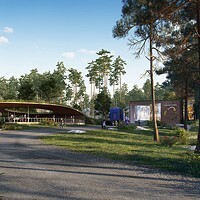 The lease comes with two automatic 10-year renewals but also includes a three-year option, or "planning period," during which the company will be pursuing the necessary permits before Nordic would have the option of putting the full lease into effect. During that time, Nordic will pay the harbor district $20,000 a year. The rent will increase to $159,128 annually after the three-year mark. Included in the terms is the right for the company to discharge 6 million gallons of wastewater per day using the site's ocean outfall pipe, which extends 1.5 miles offshore. Nordic would also pay a one-time $500,000 fee to access the district's electric substation. According to Naess and Nordic's founder Erik Heim, the company set its sights on the Samoa Peninsula property after searching the entire coastline up to Canada, looking for a place to establish a West Coast hub of operations. Humboldt, they said, fit the bill for a number of reasons: the availability of clean fresh and sea water, a central location with the markets of Seattle and Los Angeles just a 12-hour drive away, appropriate infrastructure, a nice community for employees to live, a favorable climate for development and a nearby university that happens to have an aquaculture program. "We have a freshness advantage and a CO2 advantage," Naess said in an interview with the Journal, referring to the company's stated goal of generating a minimal carbon footprint. 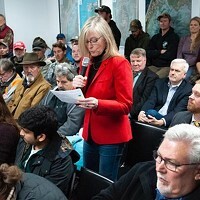 She and Heim said this West Coast hub would be a far-more environmentally friendly way to meet the United State's appetite for fresh fish than importing it from other points around the globe. The region's notoriously fragile road system didn't seem to faze them. "If there's going to be disruption, obviously we need to account for that," Heim said of the potential for closures due to weather, fire, landslides or other natural disasters, adding that some customers will be unhappy but they don't see it posing enough of an issue to disrupt their business model. Regarding the size of the proposal, Heim seemed to take issue with the "massive" moniker some have affixed to it, pointing to a facility in Miami produces about 99,000 tons of fish a year, far larger than what's being proposed here. "This is far from the biggest," Heim said. "We're trying to size this to the local market, we're not trying to build the world's biggest farm." "We're going to be selling fish and you're going to be selling fish, so I think there's some conflict there," another said. Heim said local input is a "key component" for the company and he understood the concerns of local fishermen, saying he would like to "look for opportunities to work together." That included going out with a group of local fishermen this week to hear them out but Heim also made clear he doesn't see the facility as their competition. "Wild salmon is its own category. It's a fantastic product," he said, adding that it has a different texture, taste and price point than its farmed counterpart. 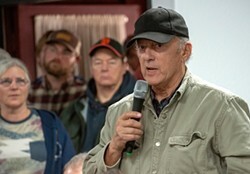 "The way we think about it is we're not impacting them, we're reducing the imports (of farmed fish) to the U.S."
Naess added that there may be room for collaboration, noting that Nordic will be building an ice plant on the peninsula that could benefit the fishing fleet and there may be opportunities to collaborate on transportation. The company is also in the process of developing an East Coast equivalent in Belfast, Maine, a city of fewer than 7,000 that fought to transform itself following the demise of a harmful legacy of chicken processing plants and canneries that polluted its bay and once left a lingering odor in the air, much the way Samoa Pulp Mill fumes blanketed Eureka in the past. Heim and Naess both said the company is big on contributing to the local community, pointing the company's offer to help underwrite the purchase of 80-acres of forest for conservation in Belfast. Nordic's proposed Maine facility, situated on Penobscot Bay, has not been without controversy, however. Belfast opponents, according to a December Boston Globe article, "say city officials are being seduced by the project's potential economic benefits into risking the hard-fought environmental improvements that have helped make Penobscot Bay one of the richest fishing grounds in the world." But the project also has support from what the Globe describes as "major environmental and scientific groups," including the Gulf of Maine Research Institute and the Atlantic Salmon Federation. 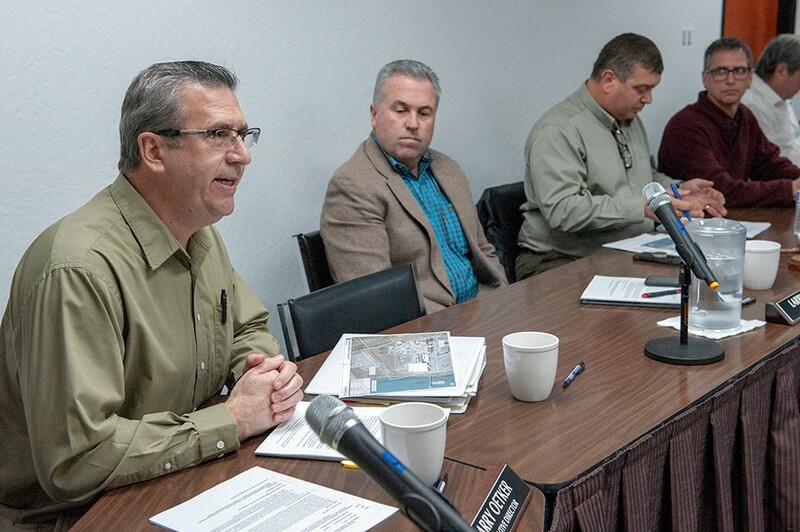 "Some of the issues that have created conflict there are kind of out of the equation here," Heim said, citing the lack of neighbors and the availability of an existing outflow pipe. Meanwhile, Heim and Naess say the outreach in Humboldt will continue as the company pursues the necessary permits for the Samoa site, with the goal of becoming what Naess described as a "serious employer in the community." But, she acknowledged, there is still "a lot of hard work ahead of us."